Finally, the UK has a sculpture prize – The Hepworth Prize for Sculpture – at The Hepworth, Wakefield. The prize has been created to celebrate the Gallery’s 5th anniversary and is named after one of the country’s most celebrated sculptors: Barbara Hepworth. In fact, the artist was born and brought up in Wakefield, and with a hint of the surreptitious – if you know the history – the Gallery has the largest collection of Hepworth’s works on permanent display anywhere in the UK. This is the very first prize in the UK to celebrate sculptural practice as a solitary discipline, surely one of this country’s strongest artistic outputs? The award will – thankfully – recognise a British or UK-based artist of any age, at any stage in their career, who has made a significant contribution to the development of contemporary sculpture – so says the Gallery. Therefore the artists are not to be judged solely on the exhibition of works present – something that I imagine will occur when it comes to the ‘people’s vote’ – where viewers will be encouraged to experience those works within the exhibition, and discuss their merits, and judge the winner for themselves. The nominated artists present a refreshing display of the varying languages of the sculptural form – Phyllida Barlow, Steven Claydon, Helen Marten and wonderful David Medalla – are nominated for this first prize for sculpture, where one of the artists will receive £30,000 from the biennial award. Steven Claydon presents the viewer with an extraordinary language structure, reminding us of the varying languages employed throughout the history of sculpture, and its many iterations. Describing how works operate outside of the narratives that the viewer projects onto the work; the sculpture conceptually breaks down into levels as complex as substance, sound, and even smell, as we are drawn into a complex multilayered language. In Claydon’s sculptural world, light – the photon – is a sculptural object; a depth of thinking reflected in the artist’s own intensity. In one work frequencies of blue light reflect off mobile phone masts disguised as trees – a blue light designed to prevent junkies from finding a vein in public toilets, but is also a frequency from natural bioluminescence. 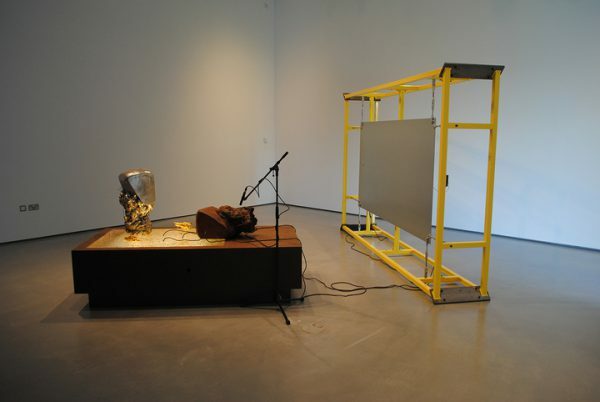 Steven Claydon, ‘Re-de-extinction Table’, 2016, installation view, The Hepworth, Wakefield. Photo: P A Black Artlyst © 2016. Claydon’s ‘Re-de-extinction Table’, 2016, include busts of William Morris creating a low-level ambient sound translated into vibration, the artist’s work swims with ideas; pressures, currencies, reciprocity, and agency are all elements discussed by Claydon, for instance, the value of gold becomes a tool to see something more clearly by coating the object – as with microspectroscopy. Language almost seems the reason for the works existence, the artist’s motivations may not be initially apparent to the viewer, but Claydon attempts to create objects that catalyse the viewer in a swirl of complex conceptuality and material poetry. Phyllida Barlow’s ‘untitled: Scree Stage’, is a work first shown in Des Moines, Iowa, in 2013. This all-encompassing work fills the gallery like a petrified cartoon forest, the viewer can also walk underneath the work between the rough concrete pillars; the piece highlights the fine line between sculpture and installation, reminding us of the complexities of modern sculptural practice; where the viewer is at once external to the work and integral, both within its universe and ‘orbiting’ external to the object. The sculpture responds to and overtakes the architecture of the Gallery. The flux and ambiguity of the sculptural object are explored as the form is turned inside out; the top surface of the work becomes a discovery. Barlow’s work is very physical, with an ambition to engage the viewer as key to the object, and protagonist – as the space, the sculpture, and the viewer are as intrinsically entwined as the artist’s materials, resulting in exploration of space and physical relationships: core aspects of sculptural language. Turner Prize nominee Helen Marten presents seven recent works which the artist describes as ‘dragging Legibility into crisis’, as like Claydon’s use of language: Marten’s is positively labyrinthine. The artist presents a conglomeration of objects and materials: hand-embroidered fabric, leather, wood, inlaid Formica, wicker, feathers, beads, shells, woven straw – and drawings of cats – forming a conceptually bewildering installation. Language is used to befuddle and confound reading. The level to which the artist works her materials presents a level of craft as excessive as her objecthood. Artist David Medalla, and ‘Cloud Canyons’, 2016, detail, The Hepworth, Wakefield. Photo: P A Black Artlyst© 2016. 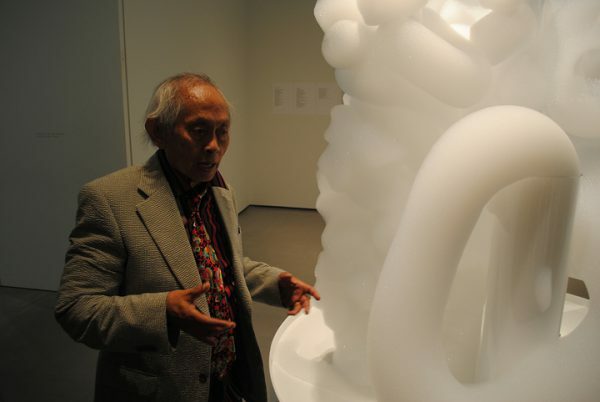 David Medalla was born in 1942, and has had a diverse career which has seen the artist interact with everyone from Man Ray to Duchamp – in fact as the artist greeted the press, he regaled us with humorous tales from his lifetime in the art world, which was in fact, an instant reminder of how different these artists languages are in this exhibition: with Medalla choosing to employ narrative to explain his practice, as opposed to the heavily layered conceptual dialogue of Claydon. With this artist, the kinetic in art is at the forefront of Medalla’s practice, as is the viewer’s interaction with the work. His art becomes kinetic interventions with the viewer, blurring the definitions of sculpture, installation, and performative action. Medalla is a charming man who presents an energy equal to his own work: kinetic, buoyant and poetic; as we stood mesmerised by his stories, and the kinetic white foam slowly exuding from vertical tubes creating ephemeral clouds of bubbles, slowly cascading down his ever-changing sculpture. The show truly represents the vertiginous nature of language in the history sculpture: conceptually complex and multilayered works, traditional responses to space, and site-specificity; dialectics concerning installation and body, the poetry of form and narrative, even the monumental. In a sense, the exhibition should win for the best-curated exploration of language in sculpture. But whoever finally takes the prize, the winner will be announced on 17 November.